My name is Molly and I first opened this website on June 25, 1999. 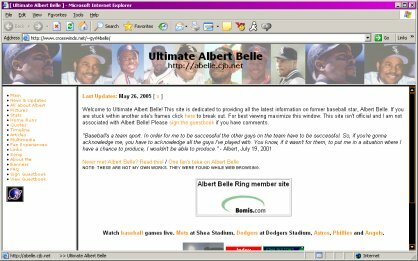 I had an idea to start the site because there were not many good resources about Albert Belle online at the time and I was looking for information on my favorite baseball player. Hopefully I have helped a lot of people learn about Albert Belle over the years and helped show more about him than what is portrayed in the media. How did you become a fan of Albert Belle?? In 1997 I used to listen to Chicago Bulls games on AM1000 which is also the Chicago White Sox radio station, and which is how I got to listening to their sports radio shows. They often discussed the White Sox and Albert Belle. Later, I saw something to the effect of Albert getting booed on TV and I was interested in understanding why he was getting booed. I watched part of an Orioles vs. White Sox game that I saw while flipping channels and then first full baseball game I ever watched was the 1997 All-Star Game (which Albert wound up not playing in). As I learned more about Belle I became increasingly intrigued, and did some research- which is how this site came into existence. I stopped watching and following baseball when he retired, but I'll always be a huge fan of his! Frank Thomas and Albert Belle "Power2"